James Campbell taught art classes at Denny High School in Stirlingshire, Scotland. He filed a discrimination claim under the Disability Discrimination Act (DDA), the UK’s equivalent of our ADA. His disability? Baldness. He claimed that he had suffered from harassment at the hands of pupils because of his lack of hair. The DDA, originally passed in 1995, has recently undergone a major revision. The revised law provides immediate protection to anyone diagnosed with multiple sclerosis, HIV and cancer. Where the ADA would cover these illnesses only if they limited “one or more major life activities,” the DDA protection begins at the point of diagnosis. This is a very generous (and for employers, a potentially onerous) definition. The revised DDA also dropped a prior requirement that only mental illness which is “clinically well recognized” be covered. Thus employers confronting untreated stress or anxiety disorders may be subject to suits under the DDA. As difficult as it is to operate under the ADA, the DDA appears to offer even greater challenges. The definition of “disability” is a moving target in all western countries. Employers who make facile assumptions about what may or may not be covered are vulnerable to prolonged litigation. For the moment, at least, there is a virtually universal assumption that baldness is not a disability. James Campbell was ruthlessly teased by his students. They may have aimed an occasional spitball at his shiny pate. Such actions definitely involved harassment. They should surely be universally condemned. But this harassment was not an act of discrimination. Campbell apparently was weak, but he was not disabled. A labor group in our neighbor to the North, New Brunswick, Canada, is seeking an end to the three day waiting period for workers comp benefits. “We really believe it is unfair,” said Michel Boudreau, president of the New Brunswick Federation of Labour. The federation has pitched the idea of scrapping the three-day waiting period, during which employees receive no benefits, to the independent panel commissioned by the government to review the Workplace Health, Safety and Compensation Commission. Boudreau said the waiting period, which was first introduced in 1993 to stem financial losses within the system, violates the principles upon which workers compensation in New Brunswick was founded. Labour, he said, entered into the system with industry and government with the understanding that it would provide for them if they were injured. In exchange for that insurance, workers agreed not to sue employers when they are hurt on the job. The waiting period is universal among the state workers comp systems, ranging anywhere from three to seven days. There is usually a retroactive period, after which coverage reverts back to day one. In Massachusetts, for example, there is a five day waiting period, retroactive to day one after three weeks. Does the waiting period serve any purpose? Or is it an undue hardship for injured workers? While a case can be made that indemnity benefits should begin immediately after an injury, such a “quick trigger” would likely create more problems than it would solve. It is difficult enough to manage a three day waiting period (the shortest duration available among the states); it would create formidable logistical problems for insurers to begin indemnity immediately following lost time from an injury. It’s worth pointing out that many employees can use accrued sick time to fill in the gap between the first day lost due to injury and the beginning of indemnity benefits. A case can be made that the anxiety of not being paid is a positive incentive for an injured worker to return to full or modified duty as quickly as possible. Immediate indemnity removes that sense of urgency. The waiting period may also serve a psychological function. The transition from wage earning to receipt of indemnity involves a major shift: one moment you are an employee, a worker, and the next you are “disabled.” For most people, this shift is inconsequential, but for some, it involves crossing a profound border from which there may be no return. The moment you become eligible for indemnity, you are being paid not to work. If you are ambivalent about your job, or if the future of the job is uncertain, the comfort of indemnity can be very powerful. Some injured workers convince themselves that the injury and the pain are worse than they really are, because there is a financial incentive to do so. This is rarely a conscious choice. Rather, it involves a “perverse incentive”: it’s financially advantageous not to get better, not to go back to my (unsatisfactory) job. The Insider recommends that New Brunswick leave the waiting period right where it is, at three days (the generous end of the waiting period spectrum). The gap in payments is not great enough to cause tremendous harm; conversely, the potential hazard of instantaneous benefits would not just increase costs of the system, it could also harm otherwise motivated employees. Comp is never the best of all possible worlds. It is tempting to tinker with every aspect and every benefit. While I understand where labour is coming from, in this situation the advice of my late mother-in-law might be best: just leave well enough alone. We’re honored to be hosting this 50th edition of Cavalcade of Risk, a smörgåsbord of some of the best posts from blogs that focus on the realm of risk. We have a hefty helping of posts so we’ll dispense with further formalities and just dig right in. Which countries have the best health care systems? That’s a question Jason Shafrin of Healtcare Economist answers as he takes us on a whirlwind tour of health care systems around the world. Are we looking after our student’s health care? Bob Vineyard of Insure Blog tells us why student health insurance is a disgrace. Richard Eskow of Sentinel Effects discusses why the words “universal coverage” ring hollow when it comes to the health care plans being promoted by the current roster of candidates. Ouch. Louise of Colorado Health Insider relates a first-person account of the frustrations inherent in the health care system even for those who have insurance in her post about being caught by the out of network deductible. David Williams of Health Business Blog discusses the risks and costs involved in pharmaceutical research and development and posts about a promising development for the pharmaceutical pipeline. Leon Gettler of Sox First considers the extent that the subprime meltdown might be the result of the mark to market accounting technique where assets are given a value that’s a fantasy. What can we learn from a yo-yo? Dorian Wales of Personal Financier draws lessons from examining the wild swings of the Lehman Brothers’ recent stock price. Jacob of Early Retirement Extreme reminds us that “being in it for the long term” does not make investing in stock risk free. He discusses the major risks of buy and hold index investing. In his post 30 Minutes, 30 Cents, 30 Billion, Charles H. Green of Trust Matters suggests that the business world of today is heavily driven by two trends: fragmentation of processes, and globalization of scale. But he suggests that the problem is that no one is looking at the overall picture. Joe Paduda of Managed Care Matters notes that in the property & casualty insurance market, there is currently just too much capital chasing too few risks. He discusses the dynamics of the softening insurance market. Specialty Insurance Blog posts about a recent court judgment that ups the liability risk for insurance agents and brokers if they fail to communicate effectively with their clients. HR Web Cafe discusses spear phishing – an insidious type of email fraud that has been successful at penetrating corporations by impersonating communications from trusted insiders, such as members of the organization’s IT or HR team. After a visit to his doctor’s office, Ernesto TIG of Insurance Yak fantasizes about about the iMed, potentially the greatest money savings device that has not yet been invented. Nicholas White left his office to take a smoke break, and it lasted 41 hours. Here at Workers Comp Insider, we look at some of the scary risks you take when you get on an elevator. At Get Rich Slowly, J.D. asks what you’d do if your cost for energy suddenly quintupled as it did for some of his Alaskan readers. In the light of many recent product recalls, Silicon Valley Blogger of The Digerati Life notes that we face some risks when we fork out money to buy goods and services. 10 tips for being a smart and safe consumer offers advice on how to avoid those risks make safe and wise purchase decisions. Raymond at Money Blue Book suggests that fliers should always pay by credit card to protect against losses with airline bankruptcies, and discusses ways to get a refund when an airline or travel agency goes belly up. As money gets tighter for many, Tisha Kulak of American Consumer News offers 10 warning signs of debt disaster and discusses what to do when you owe taxes but can’t afford to pay. 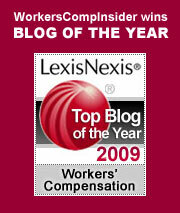 Workers Comp: An Obligation to Get Better? In conventional medicine, people are generally free to choose their care, up to the limits of their coverage. They can opt for certain procedures or decide to forego them. For the most part, adults are independent players in the medical system, acting in accord with their own wishes. In the final analysis, our health is an individual concern, factoring in, of course, the concerns of family members and “generally accepted” medical practices. Workers comp is somewhat different. In addition to the preferences of the injured worker, his/her family and the treating physician, you have to take into account the interests of the employer, who is paying the bills (no co-pays or deductibles for the patient). Unhealthy behaviors or refusing treatment might be acceptable in conventional health care, but they raise compelling issues in workers comp. The case can and should be made that under comp, the injured worker has an obligation to get better. Let’s look at two cases: one involves an invasive diagnostic procedure, the other medically imprudent behavior. Sewell Chan writes in the New York Times about Brian Persaud, a 33 year old construction worker. He was working at a Brooklyn construction project when he sustained a head injury. He was driven to New York Presbyterian hospital, where he received eight stitches for a head wound. As part of standard medical procedure, doctors wanted to perform a rectal exam, in order to rule out spinal injury. Persaud objected, a physical struggle ensued. While it’s not clear whether the invasive procedure even took place, Persaud filed a civil suit, claiming that the exam comprised assault and battery at the hands of hospital workers. Persaud’s lawyers turned to two experts, a neurologist-psychiatrist and a forensic psychologist, who testified that Persaud suffered from anxiety, depression and post-traumatic stress disorder as a result of the episode. The hospital put forward a doctor who testified that a rectal examination is an important part of advanced life support for trauma patients. The case took eleven days to present, but the jury rejected Persaud’s claim in less than an hour. In this case, the invasive procedure was deemed necessary to rule out more serious injuries. In general, patients may decline medical treatment if they are informed of the consequences of doing so and capable of making such a decision. But doctors have more leeway to perform a procedure if a patient has sustained a potentially life-threatening injury and if the doctor doubts the patient’s capacity to make informed decisions. While the employer’s interests were not directly represented in this confrontation, they were part of the mix: the employer would want to ensure that Persaud received a complete diagnostic work up, so that liability for this particular claim would be limited to the incident that occurred at work. Persaud’s refusal of a necessary diagnostic test might lead directly to expensive medical complications. Which leads us to our second example (from Lynch Ryan case files). Maria M. worked as a maid for a home cleaning service. While approaching a job site, she slipped and fell on an icy sidewalk and broke her ankle. (It had recently snowed, so there was no negligence on the part of homeowner.) No question about compensability here. In order to repair the break, a temporary pin was inserted. Unfortunately, Maria was doctor-phobic. She refused to have the pin removed. As months went by, her condition worsened. She walked with a pronounced limp. The employer tried to accommodate her on light duty, but eventually they ran out of tasks. Maria was only getting worse. She was terminated due to her inability to perform the work. The insurer was caught in the middle of a difficult situation. The injury was clearly compensable, but Maria’s refusal to cooperate in her treatment involved “wilful intent” – a refusal to get better. The carrier had an opportunity to deny the claim within the six month “pay without prejudice” period, but they failed to do so. The claim dragged on. Even after an independent medical exam favorable to the employer, the carrier continued paying the claim. Eventually, the case settled for about $35,000, for the indemnity and loss of function exposures. Given the severity of Maria’s condition, this is not a huge settlement. (The carrier feared an exposure of twice that amount.) However, the employer expressed frustration at the increase in his comp premiums. Maria’s disability was the result of her own refusal to cooperate with recommended treatment, not the work-related incident itself. In the world of comp, the interests of employee, employer and medicine itself strive for an elusive balance. In the case by case, state by state approach, results vary dramatically. It’s hard to find a consistent pattern. In the ideal world, injured workers do everything possible to get better and their employers do everything possible to facilitate a return to work. But in case you haven’t noticed, we live in a world that falls way short of the ideal. Sodium dichromate is a very dangerous substance, yet the 100+ workers at the Qarmat Ali water injection plant worked in and around the substance without protection. Some workers were observed eating lunch on the floor next to chemical tanks and others exhibited nosebleeds, eye problems, shortness of breath, and ulcers on the skin. Regular readers may recall that we’ve discussed Iraq-based contractors previously – all contractors – whether nationals or foreign – are covered by the Defense Base Act. Although this involves some creative insurance arrangements, the DBA essentially acts very similarly to workers comp. As with workers comp, one of the cornerstones of the coverage is that the DBA is the employee’s exclusive remedy. In other words, it is an employee’s only legal redress in the event of injuries or illnesses. However, in workers comp, there are generally some exceptions, although the window for such exceptions is pretty narrow. Some states allow an employee to pierce the exclusive remedy shield if “willful intent” of injury can be proven or if there was substantial certainty that an injury would have been likely to occur. The burden of proof is on the employee, and courts usually require something more that goes beyond the realm of mere negligence – the employer’s actions need to be quasi criminal. “But the company’s own actions have undermined its case: To avoid payroll taxes for its American employees, KBR hired the workers through two subsidiaries registered in the Cayman Islands, part of a strategy that has allowed KBR to dodge hundreds of millions of dollars in Social Security and Medicare taxes. Interestingly, this “independent contractor” argument is the same one that Blackwater is using to justify why the company didn’t pay $50 million in U.S. payroll taxes. So far, the IRS isn’t buying that argument – they don’t think that the Blackwater workers fit the definition of contractors. It seems that Blackwater might be trying to play both sides of the fence by not paying the taxes which would be an employer obligation but claiming the employer privilege of exclusive remedy afforded by the DBA when it comes to other matters. My colleague has talked about the matter of independent contractors vs employees several times in the past – most notably in the case of the fascinating Fedex state-by-state saga 1, 2, 3, 4, 5, 6 and 7. It will be interesting to see how the matter of these giant federal contractors play out. Being a military contractor is apparently good work for the firms that can get it: lucrative no-bid contracts, U.S. taxpayers subsidizing the DBA coverage, and little in the way of pesky employee taxes, labor laws, or government oversight. In looking into these issue, we stumbled on the Defense Base Act Blog (who knew there was such a critter?!) and blogger Aaron Walter makes some good points about being careful what you wish for – if KBR is not covered by DBA, then thousands of injured or deceased employees and their families would no longer receive income benefits or medical treatment. He also has good commentary on the Blackwater matter. Maggie Mahar and Niko Karvounis have posted a fine new edition of Health Wonk Review at Health Beat. They’ve done superlative work in summarizing and commenting on each post, making it a very good read indeed. While visiting Health Beat, be sure to check out some of Maggie’s other posts – in the sidebar, there’s a collection of links to some of the blog’s most frequently read posts – a good starting point. Maggie is a health care author and journalist. Her series on The Politics of Health Care Reform (part 2) was recently featured on Talking Points Memo. All insurers require a co-pay on prescriptions, generally running from $10 to $35 dollars, with incentives for choosing generics over brand names. Despite the fact that some drugs cost hundreds, even thousands of dollars per month, the total exposure for the consumer has been the co-pay ceiling. Not any more. Under Tier 4, insurers are charging patients a percentage of the cost of certain high-priced drugs, anywhere from 20 to 33 percent. For the most part, Tier 4 covers exotic new medications for serious illnesses, medications where there are no cheaper alternatives. Patients are in a box – and if they cannot come up with hundreds or even thousands of dollars per month, they may literally end up in a box. Tier 4 drugs include those for treating multiple sclerosis, rheumatoid arthritis, hemophilia, hepatitis C and some cancers. Tier 4 targets “high cost drugs used to treat a relatively small number of people who suffer from complex conditions.” Heck, if you don’t have the common sense to avoid getting sick, we’ll add to your misery by making you pay through the nose. Take the case of Julie Bass, a 52 year old Florida resident suffering from metastatic breast cancer. She is disabled and covered by a Medicare HMO. Her doctor has prescribed Tykerb, which her insurer has designated as a Tier 4 drug. The monthly cost is $3,480 for 150 tablets – a 21 day supply. Given Bass’s very limited financial resources, there is no way she can afford the co-pay. Tier 4 for her may be the equivalent of a death sentence. Insurers are quick to point out that they are saving healthy people money: by pushing the cost of the drugs directly onto the patients, premiums for everyone else will remain (theoretically) lower. To which I say: no one is seeing lower premiums. At best, you have lowered the rate of the annual increase. As Tom Lynch pointed out in the Insider’s instructive five part series on health care in America, the administrative bureaucracy in American medicine runs over 30 percent of total costs (no other country exceeds 10 percent). Some portion of the boated admin is eaten up by the good folks who dream up things like Tier 4. This is clearly a situation where the affluent will be able to survive certain illnesses and the poor will not. Recent reporting in the Las Vegas Sun investigates OSHA’s practice of reversing its findings and cutting fines for employers involved in construction fatalities. Reporters found nine instances where penalties for safety violations related to these fatalities had been scaled back after OSHA officials met privately with contractors. This reporting is the second part of a two-part series on construction deaths in Nevada. The first segment entitled Pace is the New Peril looks at a recent building boom that has claimed the lives of nine workers in sixteen months. Exclusive remedy prevails in NJ – a suit for damages against a NJ employer was dismissed by the state’s superior court in the case of a driver who was struck by a vehicle while unloading supplies from his truck. The employee had sued claiming gross negligence on the part of his employer as well as the company where the delivery occurred, stating that he had not been provided cones or flares and had alerted his employer about the safety problems that existed at this particular delivery spot. In so deciding, judges said there was not enough evidence in the case to show the companies “deliberately intended to harm (Dadura) or knew that the consequences of its inaction were substantially certain to result in harm.” In most states, there is a very high bar for piercing exclusive remedy – employer negligence would have to reach a level of being intentional or certain. Combustible Dust bill – Last week, a House Education and Labor Committee passed a bill that would require OSHA to issue an interim final standard regulating combustible industrial dust within 90 days and a finalized standard within 18 months. This progress represents only one hurdle however – the bill still must gain House and Senate approval in the face of significant opposition. Soldiers suffering high rate of mental health problems – The New York Times reports that army leaders are concerned about the mental health of soldiers who face multiple deployments to Iraq. More than 197,000 have deployed more than once, and more than 53,000 have deployed three or more times. According to an Army survey of combat troops sent to Iraq for the third or fourth time, more than one in four show signs of anxiety, depression or acute stress. This means that American employers should expect a high rate of PTSD for citizen soldier veterans when they return to the workplace.